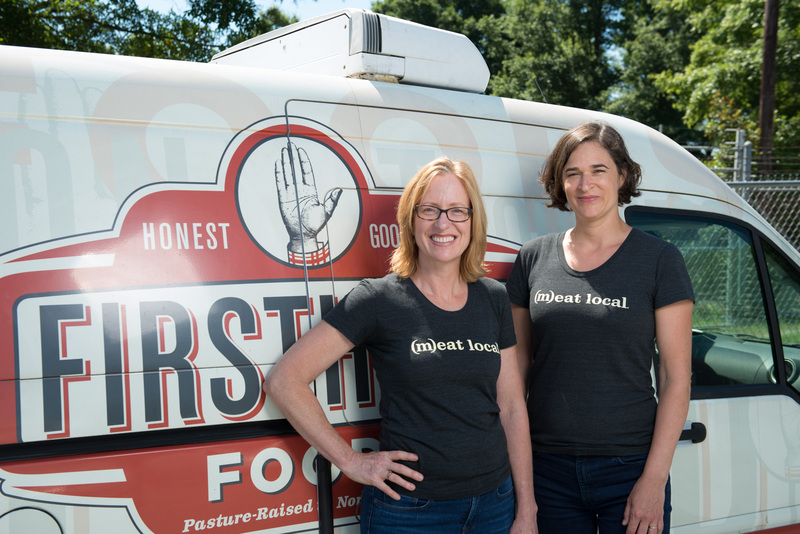 Durham-based Firsthand Foods has a mission of providing locally-sourced pork, beef, lamb, sausage and other local meat to chefs, retailers and consumers who truly care about helping small-scale livestock producers in North Carolina. The Produce Box has had a partnership with Firsthand Foods for about four years and counting, and that partnership continues to grow as Firsthand Foods expands its variety of products offered through our weekly menu. We sat down with Firsthand Foods Owner Jennifer Curtis to discuss the company’s mission and values, its relationship with The Produce Box and our members, and its goals going forward. To start, could you tell us a little bit about your background? What made you want to start Firsthand Foods? I have a background in agriculture and food systems at NC State’s Center for Environmental Farming Systems. There, I led the NC Choices program, helping address the challenges and opportunities in livestock production. I also have a master’s degree in public health and worked as a consultant in environmental and sustainable agriculture policy. I started Firsthand Foods with my business partner, Tina, eight years ago. She and I share a common passion for business as a tool for social and environmental good. It was definitely a big leap to move my career into the private sector when I started this business, but I really really love it. I get to have a very authentic relationship with farmers, which is something I care about. We’re in this together. How would you describe the mission and values of Firsthand Foods? We’re a mission-driven business, which really factors in a lot of values including accountability, dignity and innovation. Our mission is to help small-scale livestock producers thrive and to help revitalize our rural communities in North Carolina. We are an aggregator, so we buy live animals from a network of 45 small farmers and we do the legwork to get the meat out to various types of customers. What sorts of problems are you working to solve? One thing we noticed in the beginning is that a lot of farmers have a difficult time selling their products unless they go to a farmers market. Only so many farmers are interested in doing their business that way. At the same time, we saw a lot of chefs who wanted local meat but didn’t have the bandwidth to buy from local farmers for a year-round supply. What we do is operate between the farmers and the customers. Farmers can focus on farming while we work as a conduit for providing a sustainable fresh supply of pasture-raised local meat every week. The animals are raised humanely outdoors in natural environments, without antibiotics and hormones. The pork is non-GMO and animal welfare-approved. Everything is very clean and unadulterated. How did your partnership with The Produce Box begin? We’ve been working with The Produce Box for a good four years now. They have a similar mission in wanting to support small-scale farmers throughout North Carolina. We are an easy and convenient way for them to do that. Every time Produce Box members make an order, they’re supporting our 45 small-scale farmers, and we think that’s fantastic! 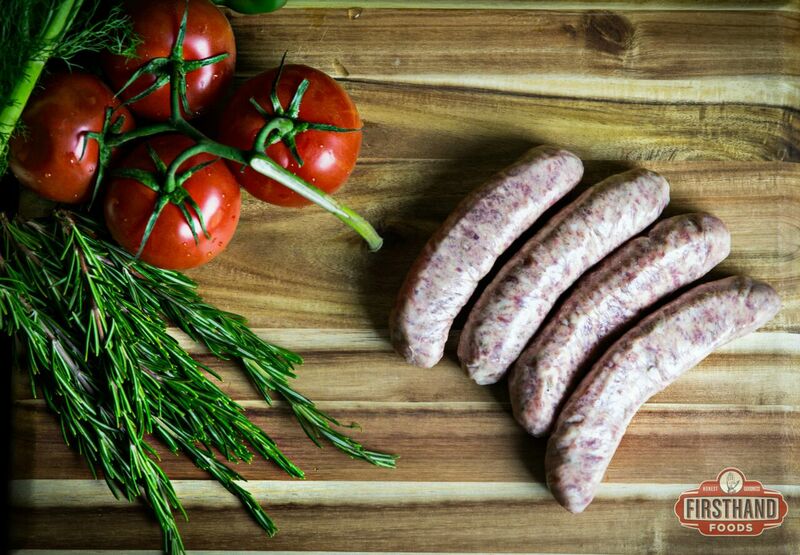 Raw sweet Italian sausage product from Firsthand Foods. We are able to give The Produce Box the ability to buy as much as they need to sell in a given period. When people order our items off the menu, such as 55 pieces of Italian sausage for example, then the Produce Box can order accordingly so they don’t have to overbuy. 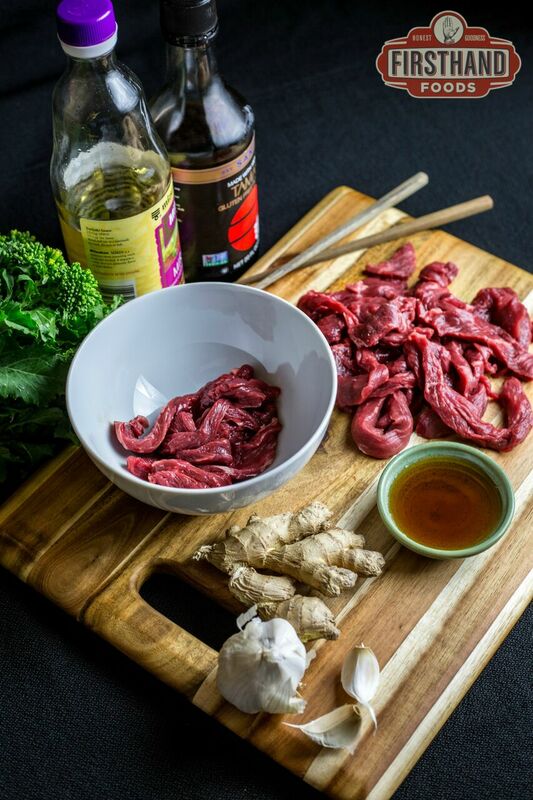 Stir fry cuts sirloin, from Firsthand Foods. What value does Firsthand Foods get out of collaborating with The Produce Box? 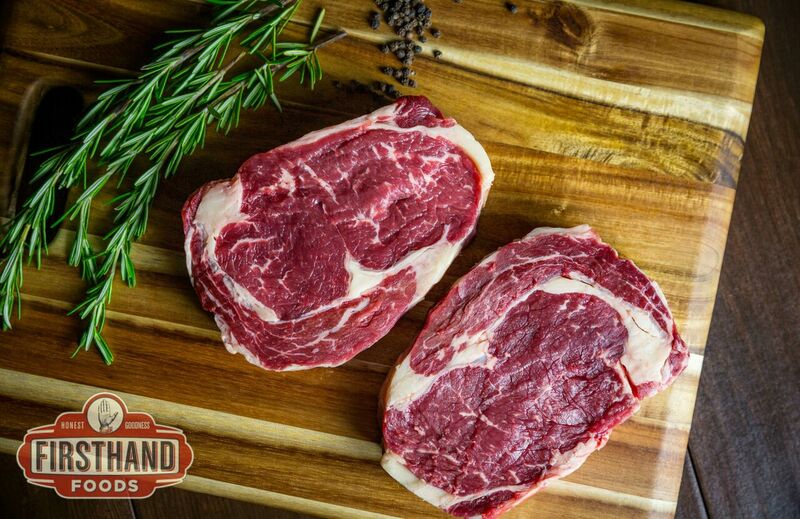 In the past, we’ve only been exclusively selling local meat in the Triad and Piedmont region and in the Triangle. But since The Produce Box has a presence all over the state — especially in markets like Wilmington and Charlotte — one thing that we really appreciate is the opportunity to get our meats out to the wider network of communities in North Carolina through The Produce Box. This also helps us because if these customers weren’t buying our meats, we’d be supporting fewer farms. The Produce Box gives support for our mission to continue. Around 75 percent of the revenue we bring from customers like The Produce Box goes straight back to the farmers. In that way, we’re reinvesting that money back into our communities as it goes to the farmers and processing plants. What are your greatest milestones and accomplishments to date? There are very few companies like ours in the country. We really think we’ve got something special in terms of how we work with farmers and customers. Typically, you see cases where an individual producer faces the difficulty of having to scale and sell products year-round; or cases in which larger distributors are sourcing parts of the animal, not the whole thing. Our solutions address these issues by helping build community-based food hubs for small-scale farmers focused exclusively on local meat. We feel that we really provide value for everyone in the supply chain. We are also proud to be able to be one of the only women-led meat companies in a male-dominated industry. Whether it’s farmers, processors or chefs, the industry is mostly men, so we’ve had to put extra work into proving ourselves. We were attracted to starting this business because we are problem-solvers interested in finding solutions to how local meat is raised, decreasing the impacts on the environment, and restoring the independence of workers and farmers. We really wanted to do something different. It’s about supporting everyone in our supply chain rather than squeezing everything out of them. As we continue to get creative and find out what customers like, we’ll be expanding into more and more products. This is a partnership we want to last for many years — it’s great for The Produce Box members and for our farmers! Raw ribeye from Firsthand Foods. 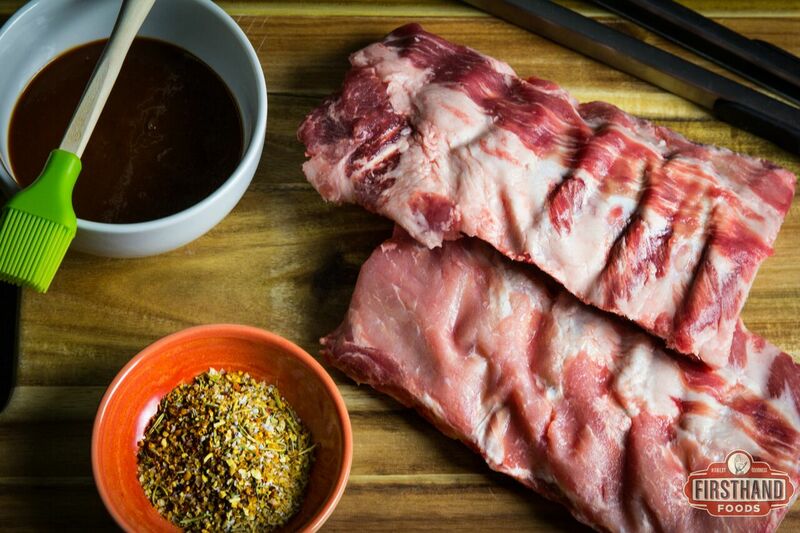 Baby back ribs from Firsthand Foods. Is your ground beef pasture/grass fed? I want as organic as I can obtain. How about the chickens? Are they pasture raised? Currently I’m buying grass fed beef and organic whole chickens from Whole Foods. I have to drive from Fuquay Varina to Cary to use a Whole Foods store. I’d be very happy to purchase this meat through the Produce Box if it’s grass fed beef and chicken. Also I would love to be able to obtain large beef bones for making soup. Can this, possibly, be included in your offerings? Thank you so much. Hi Nancy – We do have pasture/grass fed ground beef. Specifically, Moore Brothers Natural ground beef found on our menu is from Cattle that are raised and farm fed in a totally natural environment without the use of antibiotics or growth hormone. Our poultry is from Joyce Farms, who also uses very strict guidelines. This is how they detail it on their site: No pesticides EVER, No animal by-products EVER, No hormones EVER, No growth stimulants EVER, and No antibiotics EVER. We have not yet had beef bones on our menu but we are adding new items every month! Please feel free to reach out directly to us at info@theproducebox.com for more info. Thank you!